Support on the night came from London quartet CROWS, who combine elements of Joy Division-esque post punk and indie rock with more than a touch of doom influences. Frontman James Cox has an undeniable magnetism and its all eyes on him as he swaps between softer melodies into a standard SM58 microphone and screams into a rock n roll style vintage mic drenched in reverb and distortion. The vocal variance keeps the listeners interest over what is at times a cacophony of droning guitar and bass. The singer did also hug me in the front row while performing, so I’m somewhat obliged to write positively. Hugs aside Crows had a great showing and were well received by the Cardiff crowd, having already performed on a number high profile tours all signs point towards Crows continuing their ascension. Crows have just released their debut album Silver Tongues on IDLES frontman Joe Talbot’s label Balley Records. IDLES have gone from strength to strength in recent times, after years on the punk circuit they exploded into the public consciousness with 2017 album Brutalism and last years follow up Joy As An Act Of Resistance reaching number 5 in the UK album chart and appearing in just about every ‘Best of 2018 list’ known to man, made it apparent that IDLES are very much here to stay. The massive increase in popularity is evidenced by the speed with which the entire tour sold out, in just minutes, tickets to the 10 UK dates had all gone….. 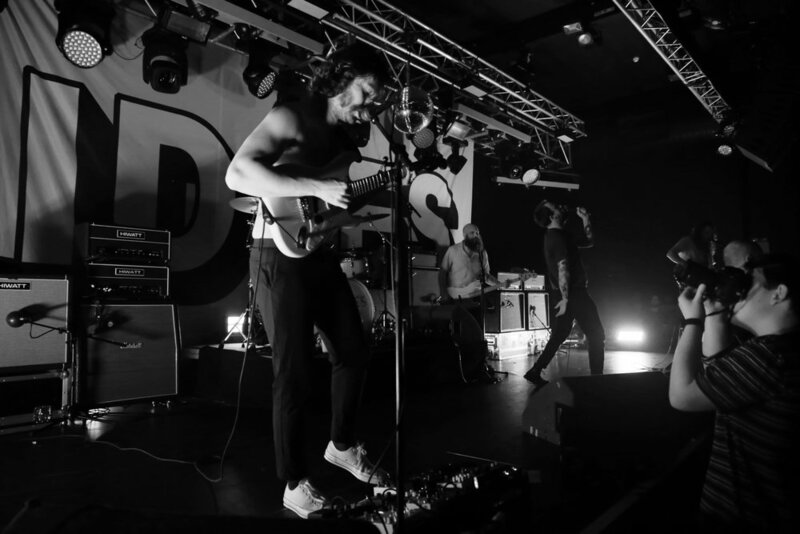 While the desire to play in smaller, more intimate venues fits well with the ethos of the band it also leaves many fans missing out and this will surely be the last time IDLES are seen in rooms of this size. For those of us fortunate enough to attend, the anticipation is palpable, the noise from the audience is near deafening as the lights go down and IDLES take to the stage. Monolithic angular riffs and a tireless rhythm section provide a concrete backdrop for Joe Talbot’s barked lyrics which are as humorous and esoteric as they are anthemic, it’s a rare combination and one which IDLES have perfected. At times the vocals faltered which Joe dedicates to the failing of last nights sound engineer, but tonight in the Tramshed the engineering is as impeccable as the band. 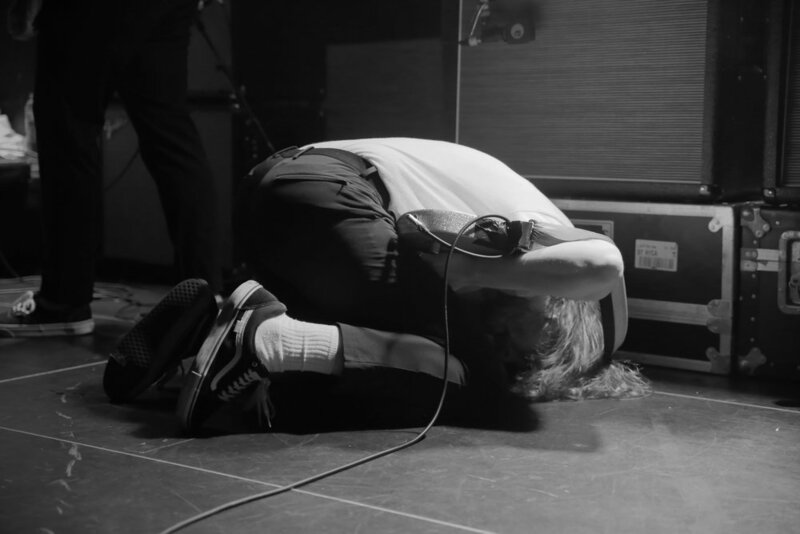 The joy that IDLES promote is unavoidable, their music inspires all the mosh pits and crowd surfing you’d expect at a punk show while Joe ensures his audience are safe and looking out for one another. As well as rallying cries for unity and to save the NHS the frontman also uses his time between songs to make a couple of not so subtle jabs at media sparring partners Sleaford Mods. The space where Joe’s voice is weaker only draws more attention to the unrelenting raucous sing-a-longs, everyone in the room appears to know every verse and the fanaticism of the Cardiff crowd is on display throughout the night. 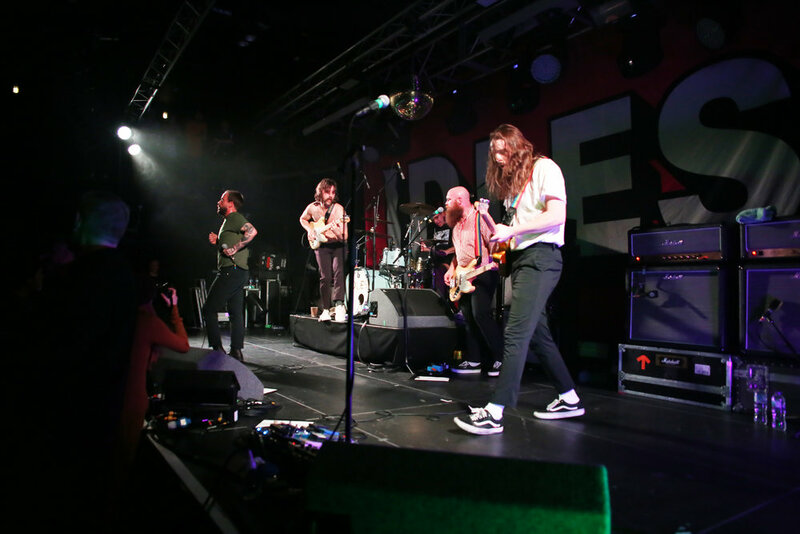 IDLES respond by breaking down any barriers between artist and audience, band members are regularly in the crowd and the crowd invited to take to the stage during ‘Exeter’ where they jump around and strum guitars whilst the band take time to wander the crowd, hugging and greeting their die hard followers. It’s hard to pick out highlights in such a consistent performance but the audience response to ‘I’m Scum’, ‘Well Done’ and ’Mother’ at times drowns out the band, which is no easy feat with a band this loud. And I would be remised not to mention the seemingly impromptu and entirely unexplained a capella section of Mariah Carey’s ‘All I want For Christmas Is You’ which Joe and Bowen treat us to. ‘Rottweiler’ makes for a ferocious finale and as the dust settles and feedback rings out it, is clearer than ever that IDLES are one of the must see bands on the circuit right now and are perfectly poised to become one of the defining British acts of a generation. If you didn’t get a ticket to catch them on tour, you’ll be able to catch them at the following festivals over the summer; Truckfest, Glastonbury, Boardmasters, All Points East, Isle of Wight, Standon Calling, Y Not, Green Man, The Downs Bristol and a ton across Europe and beyond.